Marissa Robison and her husband, Jake, with daughters Allie and Annabelle. 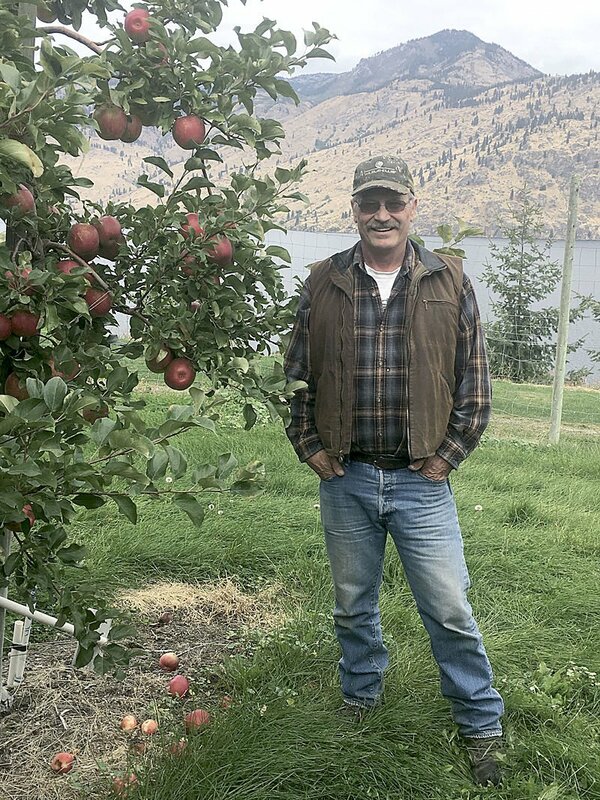 Dave Robison is the third generation owner of Robison Farms, a small family operation near Chelan, Wash.
Robison Orchards is a small family operation near Chelan, Wash., where four generations of the family have worked. Jake Robison, the manager, is fourth generation in the orchard his great-grandfather started nearly 70 years ago. Jake’s grandfather, Ernie Robison, continued with the orchards starting in the late 1960s. “Then 15 years ago he turned it over to my dad, Dave Robison, and my uncle Allen Robison,” Jake said. About four years ago his dad and uncle split the orchard, so the next generation could come back and take over. Each family could go its own way. “Allen’s children can continue with his half, which is called Robison Family Farm, and our part (my dad and myself) is Robison Orchards,” he explained. “Currently we have about 120 acres. About 70 acres we own, and the rest is orchard leased from neighbors—people who have retired and leased their orchards to us,” Jake said. Most of the orchard is in apples. “We have about 6 acres in cherries, 15 acres of pears, and the rest is apples. Over the years, we’ve grown nearly every variety of apples, but currently we have Honeycrisp, Jazz, Envy, Granny Smith, SugerBee and a few Gala. We’ve gone through a big transformation and moved away from most of the common mainstream varieties and moved into these niche varieties,” Jake said. The Envy and SugarBee apples are becoming quite popular, he said. The orchard also grows three varieties of pears — Bosc, Bartlett and d’Anjou — and a few cherries. “I came back to become the manager and this will be my sixth year. I am still learning, but I manage the actual farming part of it. The business end of it is still done by my dad. My wife, Marissa, does some of the secretarial work,” Jake said. Since its beginning, this orchard has been a member of the local fruit co-op that currently goes by the name Chelan Fruit. In the past it was Trout and then Blue Chelan. “We don’t have our own private warehouse so we just take our fruit to them. This keeps it simpler for us and lets us focus on the farming aspect and growing the fruit rather than packing, marketing, shipping, etc. This really helps us, as a small farm, since it’s hard to keep up with all the food safety regulations,” he said. He and Marissa have three small children. Owen is 3, Annabelle is 5, and Allie is 7 years old. They enjoy being out with their dad when they can tag along. The family lives in the original farmhouse that was on the property when great-grandpa bought it. 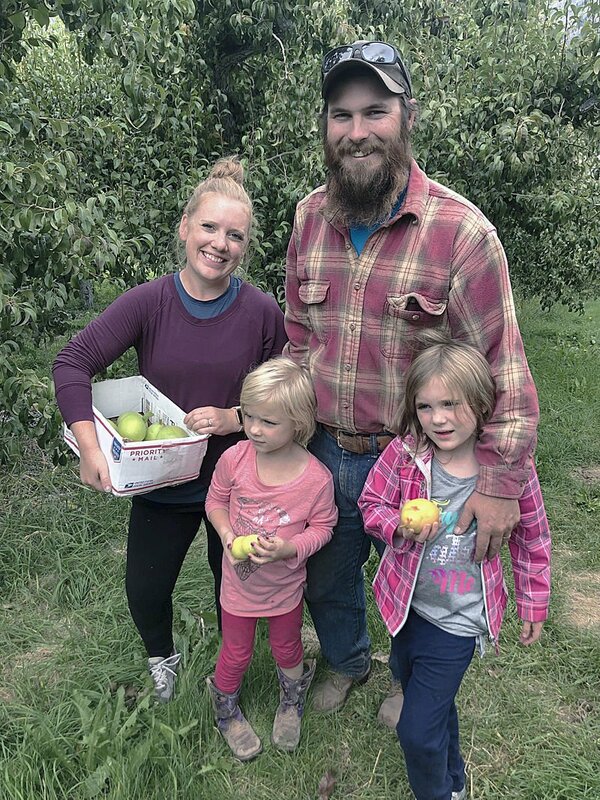 “We live there now, and the orchard is right out our back door,” Jake said. Plans for the future are simply to continue doing what they are doing now, but leaving doors open for any future opportunities. “Right now we are not into organics but this is something we may pursue with some of our fruit varieties,” he said. “At this time we are just focusing on what we know, to remain competitive as a commercial grower.” As new markets come along, he said, new decisions might be made.